Minister of Industry and Minerals Saleh Abdullah al-Jubouri received on Saturday a high-level Jordanian delegation. The delegation included the Minister of Water and Irrigation, the Minister of Transport, the Minister of Finance, the Minister of Industry, Trade and Supply, the Minister of Energy and Mineral Resources, the Minister of Communications and Information Technology, the Minister of Agriculture, the Minister of Environment, the Governor of the Central Bank of Jordan and the Secretary General of the Ministry of Industry. 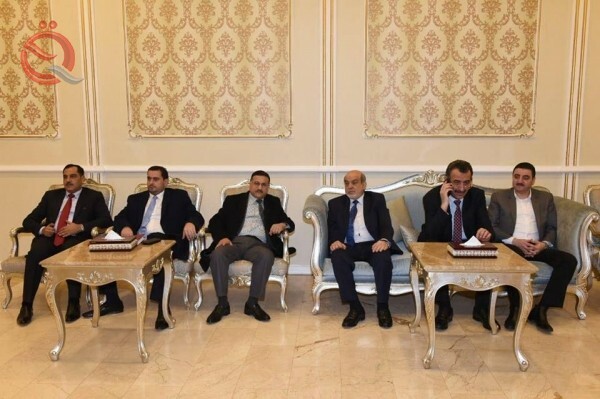 The Jordanian delegation, headed by Jordanian Deputy Prime Minister Raghani al-Muasher, will hold a round of talks with the Iraqi side to discuss and discuss future cooperation frameworks between the two countries and set timetables to include the paragraphs agreed upon in the previous talks between the prime minister Adel Abdul Mahdi and his Jordanian counterpart Omar al-Razzaz took effect. Among these agreements, the opening of the Iraqi-Jordanian border crossings to the movement of transport and granting facilities for Iraqi goods imported through the port of Aqaba, whose final destination Iraq deducted 75% of the fees charged by the Aqaba Authority and the establishment of a joint industrial city on the Iraqi-Jordanian border and the agreement on the Jordanian- During the link network and agree on the completion of the framework agreement for the Iraqi-Jordanian oil pipeline, which will extend from Basra through Haditha to Aqaba and other agreements.